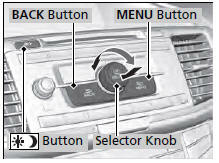 Use the selector knob or MENU button to access some audio functions. MENU button: Press to select any mode. 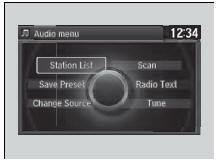 The available mode includes Change Source, Station List, Save Preset, Radio Text, Music Search, and play modes. Play modes can be also selected from Scan, Random/ Repeat, and so on. BACK button: Press to go back to the previous display. button: Press to change the audio/ information screen brightness. Press once and make an adjustment. uEach time you press , the mode switches between the daytime mode, nighttime mode and OFF mode.